I had to make a big decision over the weekend... I very adult decision if I might add! I have been in the dilemma that I want/need two things (well actually a million but this is what I narrowed it down to) a new phone or a new pair of running shoes. It has been two years and around 6 phones later... I hopped on the android bandwagon 2 years ago and regretted that decision after 2 months! I kept having to go through phones because the androids wouldn't last.. I am ashamed to share this on social media but I am actually using an Iphone 3G.. Yes you read correctly! Now you can see why I NEED a new phone! On to my shoe issue.. My mom bought me my first pair or real running shoes last Christmas. I always had Nike's or Addidas but never real running shoes. Well I wore them down pretty good! I wore them down so much that anytime I was wearing them recently I was getting blisters and my toes would be sore after a run. 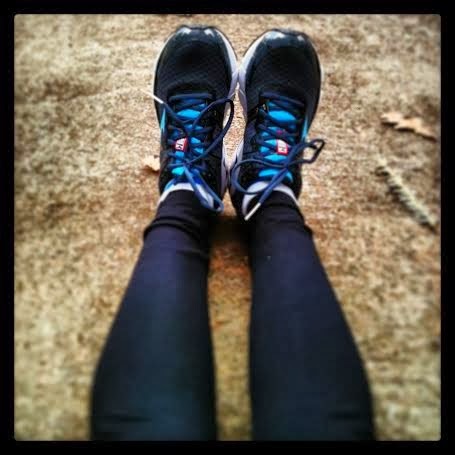 And as you know the shoes are the key ingredient to having a good run. As I have a half marathon coming up in February I knew it was important to get a new pair of shoes. As for my running... I broke in my new shoes with 9 miles on Monday. It came with a little bit of pain with my right foot... but you don't gain anything unless you go through the pain sometimes... I am 1 mile and 1 week closer to becoming a princess! 38 more days! !